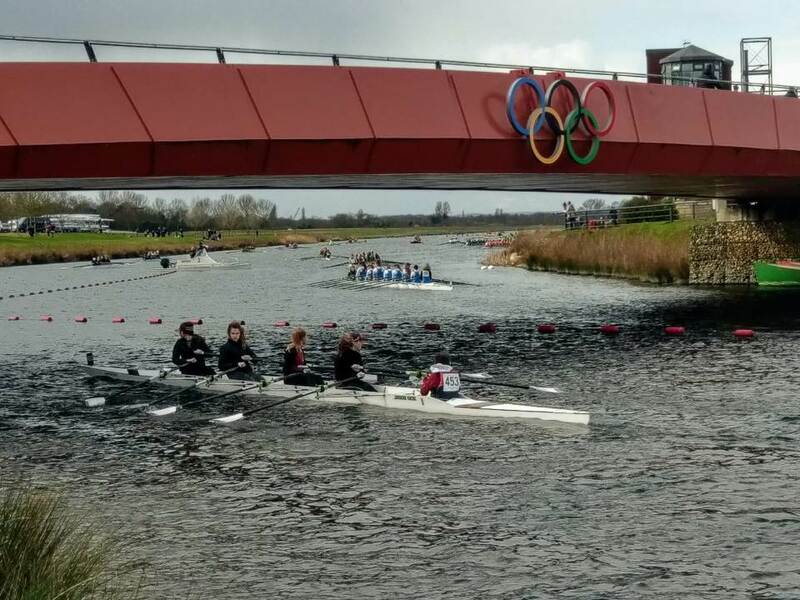 It has been a busy week for Stratford upon Avon Boat Club with last Monday seeing the J14 and J15 squads travelling down to a windy and choppy Dorney Lake for the Oarsport Junior Sculling Head. Two individually timed runs of 1800m with only a short turn round in between, tested everyone’s mettle with all performing at their best on this Olympic course. 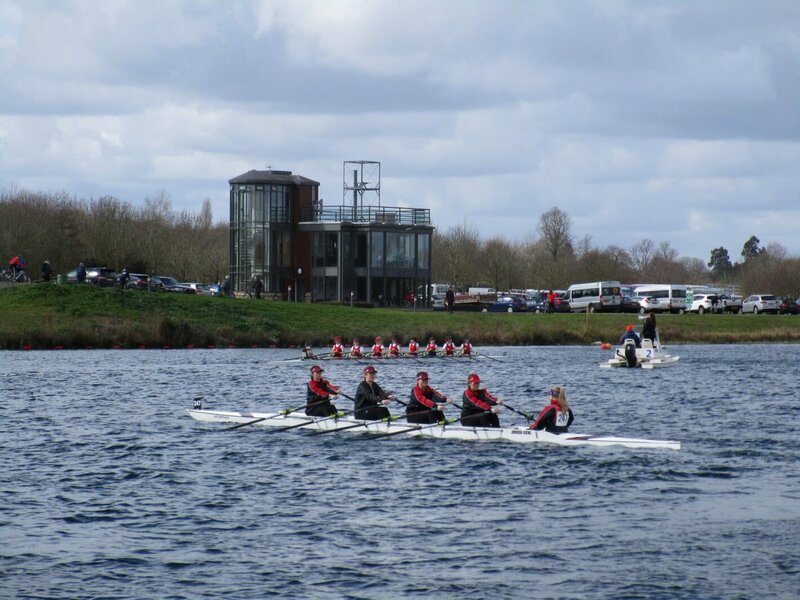 First to race for Stratford was the WJ15 quad of Abbey Meggeson, Amelie Sartain, Harriet Hodgson and Sophie Elstone coxed by Sienna Rawlings lining up into the strong headwind for their first leg. Rowing firm through the start line they set their pace settling nicely into rhythm for a first run time of eight minutes and twenty seven seconds. Almost immediately, with just enough time allowed to have a drink, the second leg began. 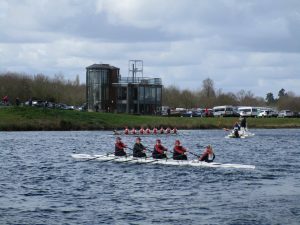 Rowing with the wind made for a quicker second time, however the effort required remained. Finishing almost a minute quicker the combined finish time of sixteen minutes and 0.1 seconds placed them twenty second out of a field of sixty six with all the big named schools and clubs featuring. Following closely was the quad of Elisabeth Edwards, Emma Harrison, Julia Zampronio Gurden and Martha Usselmann, coxed by Toby Sartain. 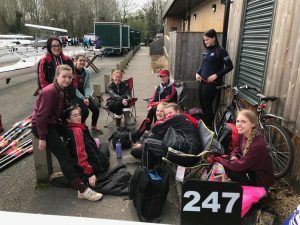 The headwind seemed to increase as they waited for their start, yet undeterred the crew set off strongly and quickly settled into their racing pace. First leg over, the run home towards the cheering crowds was a leg and lung bursting quicker time of seventeen minutes and fifty five seconds. The nominally classed ‘15′ boys quad consisted of J14’s Tomi Wilcock and Will Beattie and J15’s Conar Aitchison and Will Clarke, coxed by Mary Walton. 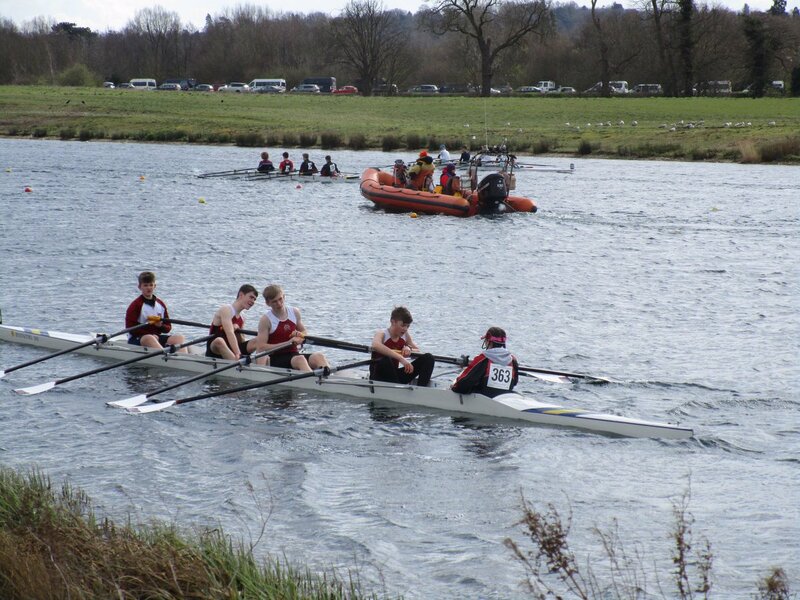 Apprehension was in the air for their first race together and for Tomi and Will B their first outing on a racing lake. 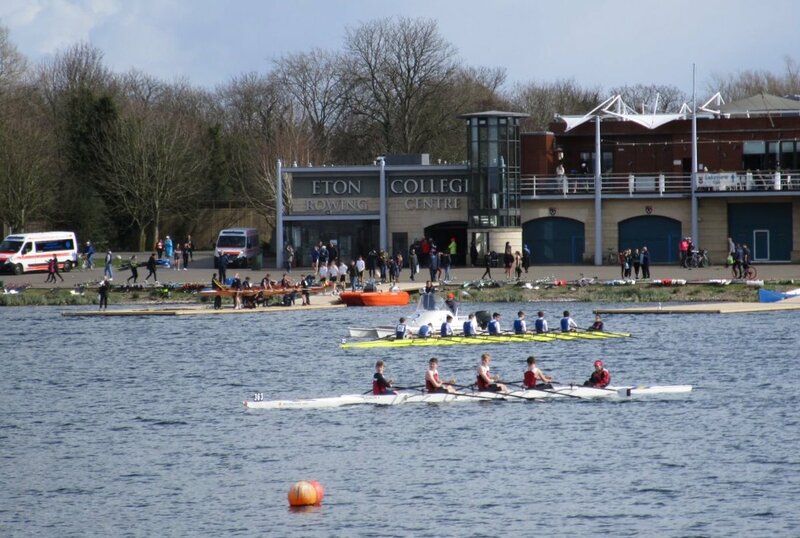 Starting well, all worries were quickly forgotten with the rhythm and pace established early in the race. This strong synchronisation carried them to the end of the first run in exactly eight minutes. 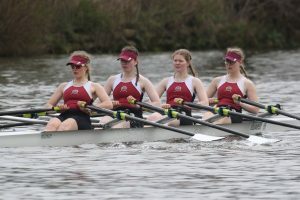 After the short recovery, Mary captained the crew to a firm second run, keeping the boys focused and working at their best together. Crossing the finish line in forty six place from a strong field of seventy, a promising first outing from a crew of mixed age groups. 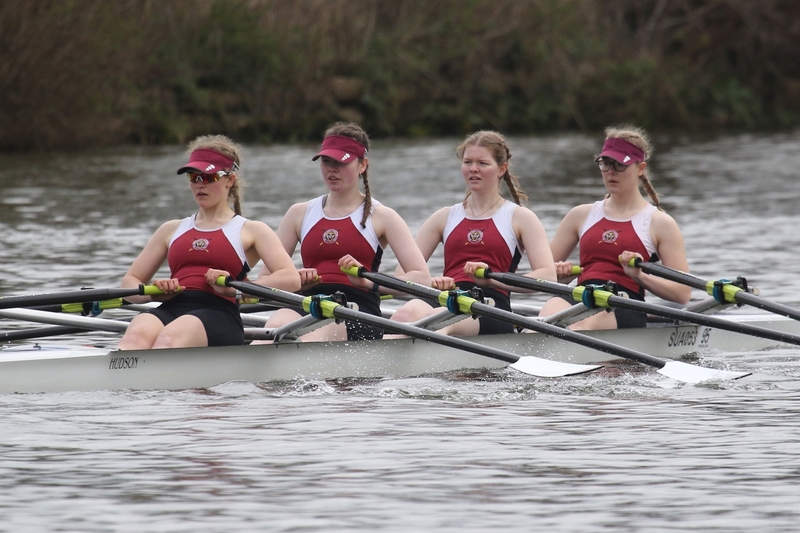 The J14 girls were us next with two Stratford crews in action. 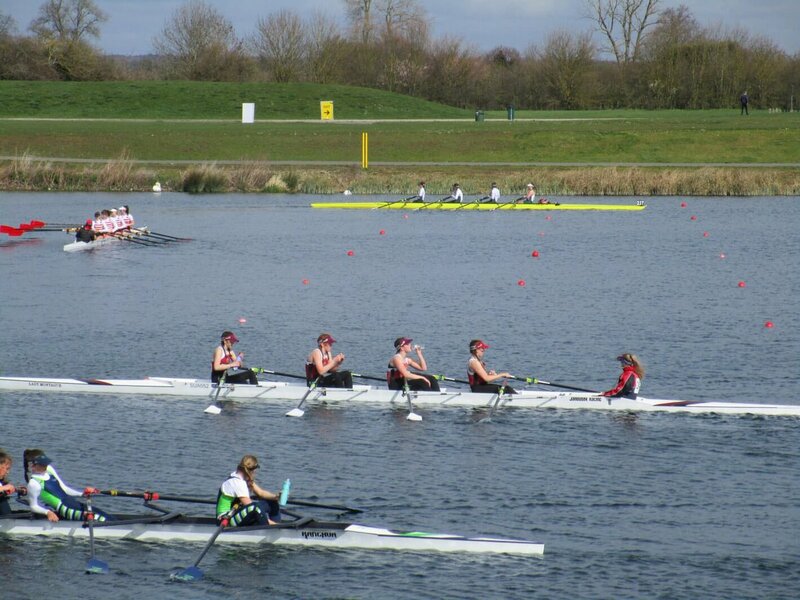 First up was the crew consisting of Freya Watts, Lucy Browne, Honour Keil, Fleur Griffiths and cox Toby Sartain. 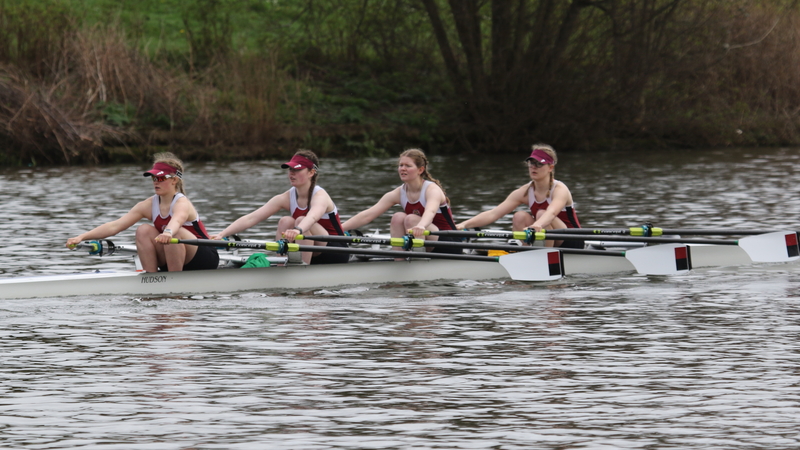 On the first 1800m leg up the length of the lake, the Stratford girls put in a very strong performance to overtake two crews in a time of eight minutes and seventeen seconds. 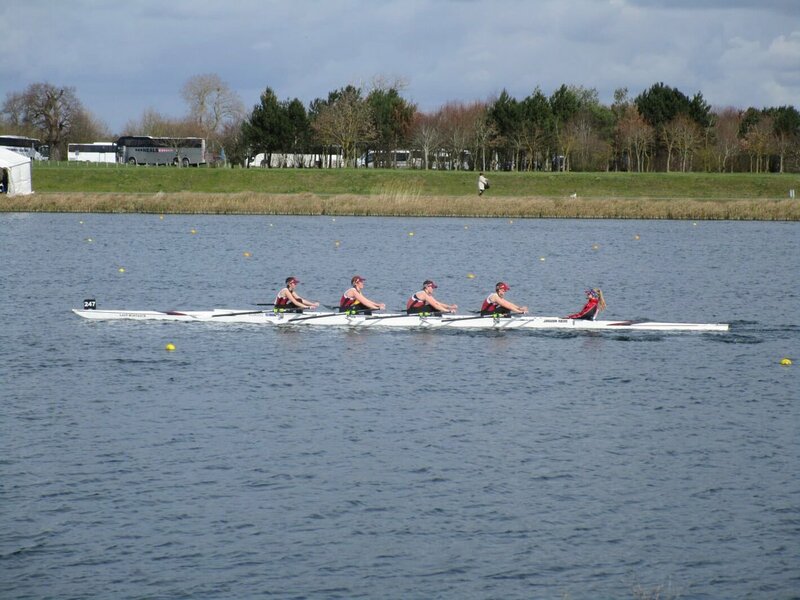 In the second leg, they were just as strong pushing away from the crews behind them and catching the crews in front. 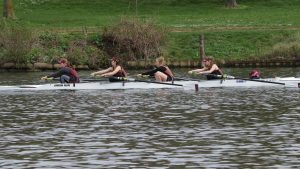 Their overall time was sixteen minutes and three seconds putting them into joint eleventh place out of the forty seven crews in their event. 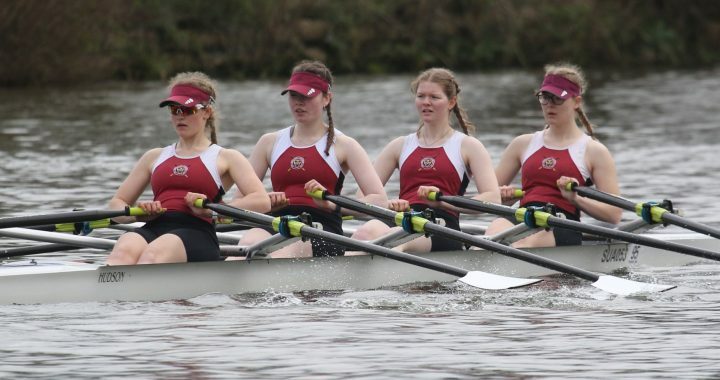 The final crew to race was the second J14 girls’ crew of Harriet Holmes, Bella Chappelhow, Ruby Howells, Anne Mynors and cox Owen Perkins. 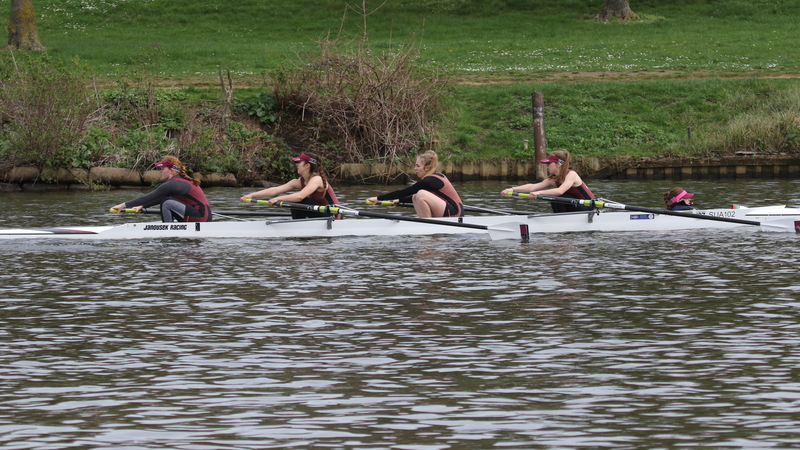 Again, another strong performance put in holding off the fast crew behind them. 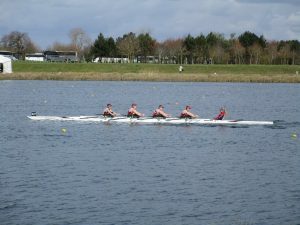 Their first leg was completed in nine minutes and five seconds. After a quick turn at the top of the lake, the girls set off back down the lake on their second run. 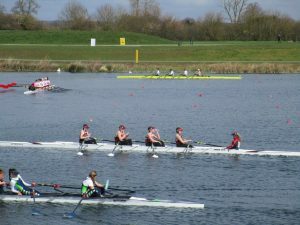 A good pace was held and the crew finished in a time of seventeen minutes and thirty two seconds giving them a place of thirtieth in the whole event and fourth out of the B division crews. 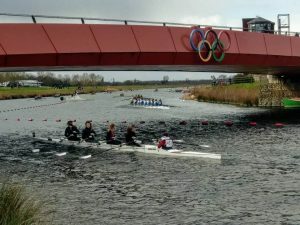 The coxless WJ16 quadruple scull of Jasmine Mountney, Maiya James, Mili Wilcock and Alice Baines sculled superbly at the head of their division. 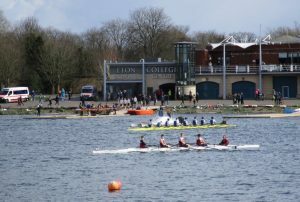 As the race progressed they pulled clear of the Kingston crew behind and moved through the crews ahead of them to record an excellent third place and just thirty four seconds off the leader in the twenty minute race. 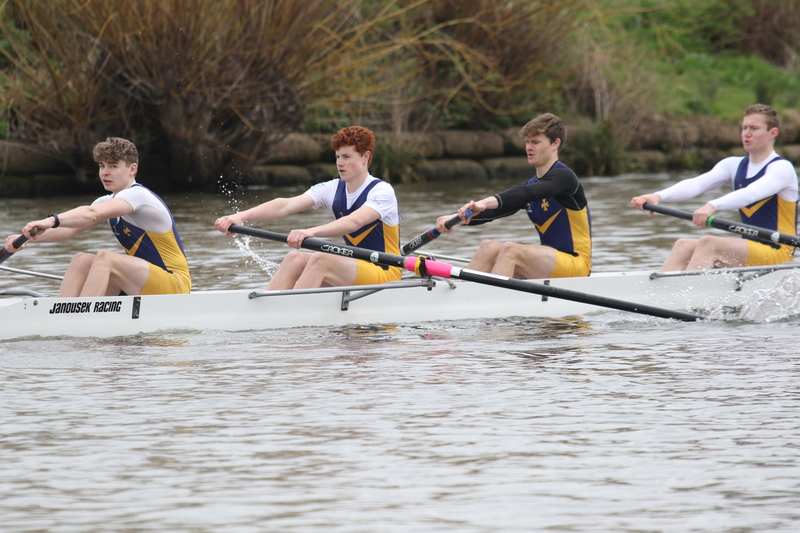 King Edward The Sixth School also competed with a boys’ coxed four of Joe, Adam, Felix, Sam and Matilda and had a tough race, competing up two age categories and saw themselves up against university crews. 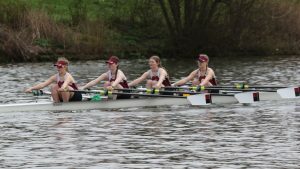 Not to be phased by this, they stayed strong finishing second, just seventeen seconds behind the winners and beating another university crew in the process by a good margin.